Buses comes in all shapes and sizes as well as different brands. The reason for the different types of buses is due largely to the way these buses will be used and the capacity they can carry. 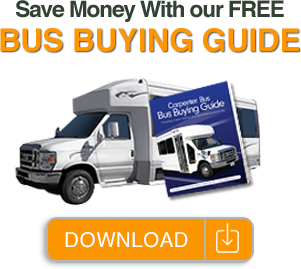 Some of the most common purchasers of buses are churches, limousine companies, senior car facilities, day cares, resorts and casinos. Each different type of client has needs specific to their industry and require buses configured accordingly. For example, most churches use their buses for longer trips in which case having a bus outfitted with reclining seats and a TV/DVD system would be ideal. Airport shuttles, on the other hand, generally do not have passengers who ride more than 20 minutes from the parking lot to the terminal. Bus needs often vary from industry to industry. One type of bus that Carpenter Bus doesn’t sell is the coach bus that is often used by transit companies like Greyhound Bus. Please click on any of the links below to learn more about specific uses of buses by various industries below. If you are not sure which of the different types of buses best suits your specific needs, please give us a call and we will be glad to assist you in your bus buying journey. Call us toll free at (800) 370-6180!